Battle Group Omega is a Starfleet Expeditionary Group assigned to rapid response missions in the Milky Way Galaxy. Shortly following the outbreak of the Dominion War, Starfleet Headquarters reviewed the tactics of Dominion and Cardassian forces and found one common tactic: targeting and destroying the military command ship of a Task Group to focus efforts on breaking down command and control. 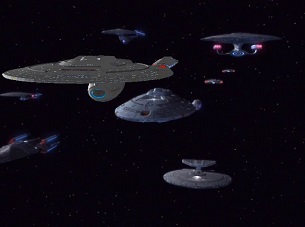 To counter this Starfleet revised a concept from Earth's] military history: the Battle Group. One of the first Battle Groups established was Battle Group Omega, a collection of a cruiser wing assigned to defend the Starship Enterprise during combat against Dominion forces. Assigned to multiple assignments during the conflict, Battle Group Omega was instrumental in freeing Betazed from Dominion Occupation. Following the Dominion War Starfleet would reassign multiple vessels both to and from Battle Group Omega to other responsibilities including its flagship, the Starship Enterprise, which was replaced in its role by the Starship Galaxy. When the Romulan Star Empire requested peace talks under Praetor Shinzon in 2379 Admiral Kathryn Janeway assigned Battle Group Omega to the Romulan Neutral Zone for patrol purposes in Sector 1045 should the USS Enterprise come under fire. Unfortunately Battle Group Omega was unable to provide assistance to the Enterprise due to its encounter with the Warbird Scimitar in the Bassen Rift. Following the engagement the Battle Group would be assigned to assist the Starship Titan with peace talks. Despite the political situation affecting the Federation and the Klingon Empire the renewed Borg threat of 2409 led to Starfleet and the Klingon Defense Force signing a mutual defense pact authorizing the reestablishment of Battle Group Omega as an independent military group assigned to defend against Borg incursion. While temporary in origin, the multinational group was led by Klingon Admiral D'Vak and was instrumental in leading to peace between the Federation and Klingon Empire. When the Borg threat ended Battle Group Omega was disbanded. With the announcement that the Klingon and Romulan Empires announced a new alliance President Gruzy of the Federation Council reactivated the idea of the Battle Group for defensive and exploratory missions in the galaxy. Battle Group Omega was rechristened as a Starfleet only organization under Admiral William Teagarden. Battle Group Omega is based upon the concept of a Carrier Battle Group currently utilized by multiple naval groups. Battle Group Omega appeared in Star Trek Nemesis.